Benny entered the world of SAR in 1991 as part of the North Carolina State Defense Militia, and was the leader of Task Force 5A. He was team leader of Down East SAR for 16 years. After being certified as a SAR TECH II in 1992, Benny became a SAR TECH evaluator in 1993 and upgraded to lead evaluator in 1995. In 2010, he obtained the position of master lead evaluator. Meanwhile, he became a FUNSAR instructor for NASAR in 1996. Benny has over 200 hours of search time and over 1000 hours of training time. His expertise is mantracking. ​Benny was approved to teach the State SAR Wilderness course in March of 2018. Retired after teaching science for 30 years in Harnett, Sampson, and Johnston County public schools, Terri completed FUNSAR in April, 2014 and SARTECH II in May, 2014. She has two adult daughters, Whitney – of Raleigh, NC and Lindsay - of Grand Forks, ND. Terri enjoys reading, learning new things, and taking good care of her two Great Danes, Roxie and Chief. Rather than joining a gym, she enjoys getting her exercise in the “briar woods”. Terri received her EMT – B in January 2015 and is a volunteer with 50-210 Rescue Squad at McGee’s Crossroads in Johnston County. She is currently pursuing EMT- P certification at Johnston Community College and is truly thankful to be a member along with the other dedicated searchers on Coastal Carolina Search Team. Dave has worked and lived in Greenville since 1997. He entered the world of public service in 1999 when he passed the FCC test for an amateur radio license. The first opportunity for Dave to put his new license to use in public service was during Hurricane Floyd. During that event he primarily served in assisting the American Red Cross with communications to coordinate meals between the various shelters. Dave served as Emergency Coordinator for Pitt County Amateur Radio Emergency Services in coordination with Pitt County Emergency Management from 2009-2011. Dave’s first exposure to Search and Rescue was in 2008 at an exercise at Bell Arthur in an experiment with using amateur radio operators in search teams. Despite the several inches of rain that day, Dave enjoyed it enough to follow with another exercise In March 2010, Dave took the FUNSAR and SARTECH II courses and joined CCST. Tabatha is from LaGrange, N.C. . She has a teenage daughter that is the apple of her eye. She has 4 dogs that are very special to her. One of these dogs was a stray that she managed to catch when he was only around six months old. Several people were trying to catch the dog and were having a difficult time. Tabatha had the dog in her truck within 5 minutes and he now has a home forever. She named the dog Bison. Having an interest in Search and Rescue, she was introduced to CCST and has completed all the requirements to be an operational member. In early 2015 Tabatha had to retire Bison because of health problems. Shorty after she managed to acquire Atlas a Bluetick Hound and worked hard to get him certified. In September 2015 Tabatha and Atlas were certified by the NC Police Dog Association in tracking. Shortly after being certified Atlas passed away crossing over the rainbow bridge. Tabatha began working her German Shepherd named Karma. On May 14, 2016 Tabatha and Karma met the standards set forth by BSAR and The North Carolina Search and Rescue Advisory Council, for tracking/trailing. Donna works for Nash Rocky Mount Public Schools Environmental Maintenance Department managing Well Water and Wastewater sites. She became a CCST member February 3, 2011 and completed the Fundaments of Search and Rescue on May 15, 2011. She then completed the Search and Rescue Technical II on May 21, 2011. In April 2016 Donna completed all the requirements to be an Operational Member of CCST. Donna has also held the responsibilities of the Team Parade Coordinator for the past several years. Donna’s long time Team Goal is to become a Certified Dog Handler. She rescued a 12 week old puppy from the I-40 Interstate in 2012 and worked with him for several years. Although, “Scout” showed positive interest at times of becoming a Search Dog, we believe he wanted more to be her loving lap dog. In March of 2017 Donna was donated a 2 month old Bloodhound puppy via Just in Case Bloodhound’s. Donna is currently training her puppy named “Denali-Nash”, who is named after the Alaskan Mountain Denali, meaning the High or Great One and Nash to Honor a fallen Alaskan IDITAROD sled dog killed in the 2016 race. Mark is a retired forest ranger who has always had a love for the outdoors. 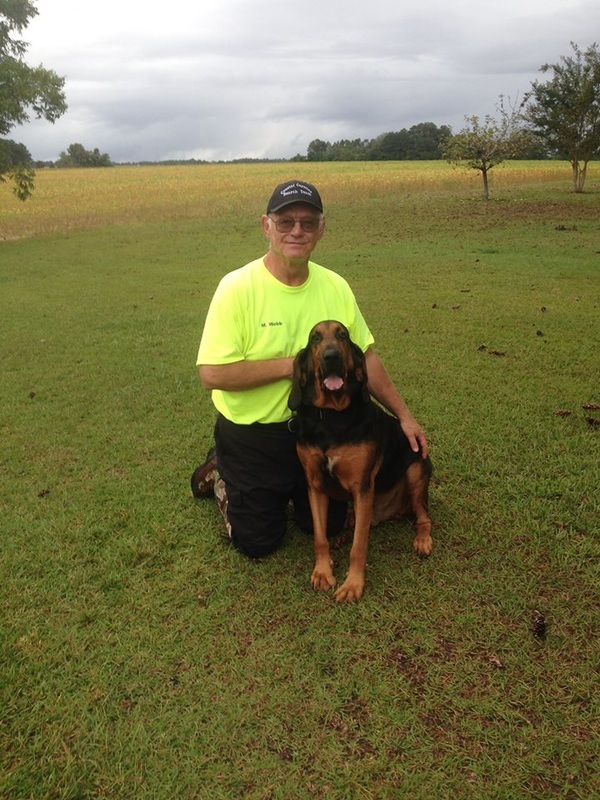 Mark has known for years that he wanted to own and train a bloodhound to search for lost people. Just a few months after retirement he started making his plan a reality. He purchased Daisey in 2003 and began training her using information from some books purchased at the local bookstore. In early 2004, Mark met Mac Morgan, Chief of North Carolina Canine Emergency Response Team (NCCERT), and was invited to join the team. Mark would like to take this opportunity to thank Chief Morgan for his assistance in pointing him in the right direction in starting a search team and training K-9s. Mark has earned his SAR TECH II certification from NASAR, K-9 evaluator for the North Carolina Search and Rescue Council and most recently FUNSAR Instructor from NASAR, as well as SARTECH II evaluator. Mark and Daisey attended numerous K-9 seminars and other training sessions throughout North Carolina and Virginia. Daisey was certified by NCCERT, North Carolina Search and Rescue Council and the American Bloodhound Club as a trailing K-9. Daisey crossed over the Rainbow Bridge in July 2015. In June 2012 Dean Hewitt donated a bloodhound puppy to Mark to be trained and used by CCST in SAR. Mark gladly accepted the puppy and named him Roscoe. Roscoe has made very good progress and in June 2013 passed the CCST certification standards for tracking and trailing. In August 2015 Roscoe passed the certification standards set forth by Brunswick SAR, CCST and the NC SAR Advisory council. In September 2015 Roscoe passed the standards of the NC Police Dog Association for tracking. As of July 1, 2018 Mark has officially retired from being an operational member and has donated his two search K-9's Roscoe and Jesse to Central Carolina K9 Search Team. Mark and his wife Gail are currently enjoying their retirement in Hayesville, N.C. and spending a lot of time on Gail's new pontoon boat on Lake Chatuge. Danielle was first introduced to the team in June 2009 when she accompanied her grandmother and mom on a trip to Sam's Club. CCST members were selling their annual fundraising raffle tickets. After a long talk, she filled out an application to join the team. She had an interest in law enforcement, specifically K9 Unit, and felt this would give her some experience. She quickly learned search dogs and police dogs were very different. Danielle completed FUNSAR and obtained her SARTECH II in March 2010. She graduated later that year from Pitt Community College with a degree in Criminal Justice. She quickly enrolled into the police academy. Things don't always go as planned. She gave up her dream for law enforcement and found a new love for EMS. Danielle obtained her EMT certification in July 2012 and Paramedic certification in December 2013. Just recently, Danielle and her husband became owners of a 2 year old German Shepherd named Demi. Danielle plans on training her for the search team. Candace become a CCST member in December 2010. She is currently a North Carolina State Park Ranger at Goose Creek State Park in Beaufort County. Candace was born and raised in Eastern North Carolina and has joined CCST to be able to give back to the local community. She is new to search and rescue, but very excited to learn and contribute to the team. Candace is also a member of the North Carolina National Guard. Roy is a certified SAR TECH II. He is currently Managing Good Stuff Auto Sales in Fountain, N.C.. Roy is very dedicated to helping out in any way possible, ground pounding, fund raising and any other thing needed. Whenever someone is needed to help in a tight situation, Roy is always there to help. _ Hyman started in Fire/ EMS service in 1972 and has been serving his community and others since that time in various capacities from firefighter, Police Officer, EMT, EMT I, EMT-P, Emergency room RN to his present position since 1997 with EastCare as a flight Nurse/Paramedic. He has also teamed with Dr. W. Price and ECU school of Medicine and does Medical escorts and providing medical support with motorcycles during events such as "Neuse River Bridge Run", "Patrol Stroll", "Dash for Cash", "Bike MS " and several other non-profit events for charity and community functions such as local festivals. Hyman has supported Mark anyway possible since he came up with the idea of the team and got interested in owning a K9 so he would not be the one hiding all the time. Ginger ( AKA : NO, LEAVE IT, STOP, OFF, DAMN IT!!!) is a Malinois born 26th June 2011. "She is very much smarter than I am and has tremendous drive and instinct" says Hyman. Her training is doing well under the supervision of Drake Parker (team K9 training officer) and Top Dog Academy. We do search exercises at least once a week and other training daily. Hyman says "Being part of the team is personally rewarding in knowing that one day Ginger and I can help our community and others by finding a loved one that has lost their way". Hyman and Ginger have received certifications from the American Police Working Dog Association and CCST's certification in Air Scenting. 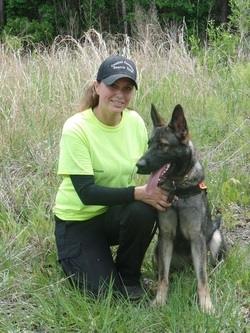 Sue and her k-9 Storm have been working together since Storm was eight weeks old. Storm was purchased in May of 2008 by the City of Greenville Fire/Rescue to implement the k-9 component for the Urban Search and Rescue Team Task Force 10. She was formerly trained to search for live people buried in disaster areas and collapsed rubble by Ed Duffy in Tampa, Florida. Sue and Storm retired from Greenville Fire Rescue and Task Force 10 in April of 2014, and subsequently joined Coastal Carolina Search Team the same year. Storm has undergone training transitioning her focus to land search. Storm, a Golden Retriever that was breed to hunt, continues to train and is eagerly learning land search which she seems to enjoy. Storm's successful transition is credited to Mark and Benny who have been instrumental in the land search training so both Storm and Sue are prepared for any deployment they are requested. Dayle adopted Vonna in 2011 with no intent of becoming involved in K9 search work. She quickly became his introduction to the working breeds, and it didn’t take him long to realize he had a dog on his hands who needed a job. They passed the Canine Good Citizen certification in late 2011 and started early work in tracking. In 2012, Dayle and Vonna attended a seminar on scent detection facilitated by Andrew Ramsey, former MWD trainer at Lackland Airfare Base. A series of events led him to developing an applied interest in HRD work, and in 2014 they attended the WCU cadaver dog workshop. He met some folks from CCST through a SARTECH II class they hosted in 2015 and has continued working with them since. Dayle has a background in medicine and art and is a strategic visual engineer for a research organization. He’s also an avid outdoor enthusiast and enjoys pretty much anything outside away from a computer. In his free time he helps non-military and non-law enforcement handlers become more familiar with scent detection and scent theory, and facilitates the working relationship between handlers and their K9 partners. Since 2012, he’s worked with over 50 teams at a range of levels on container, box, interior, exterior, and vehicle searches. He focuses on developing motivation, communication between K9 and handler, and a strong final trained response to odor. Dayle and Vonna are currently working towards certification in tracking and HRD, both land and water. Myles is originally from Wilmington, NC. He moved to Greenville after he graduated high school to attend East Carolina University, where he earned a bachelors degree in Recreational Therapy. Being from the coast, he has always loved the outdoors and the water, and is an avid hunter, fisherman, and camper. In June 2016 he married his high school sweetheart, Hannah, who enjoys embarking on outdoor adventures with him. They have 2 Labrador retrievers, one of which he is currently training to become a duck dog. He has always had a place in his heart for serving and helping others, so when he met Mark and heard about the search team it was an easy decision for him to join. Ever since, he has enjoyed every second that he has spent with the CCST. Myles passed his SAR Tech II exam in April 2016 and is currently training K-9 Huckleberry in tracking/trailing. ​Myles's wife Hannah is also a member of CCST and is very involved in assisting in training the K-9's on the team. Ellen became a CCST member in 2017. She completed her FUNSAR and SARTech II training in May 2018. Her GSD K9 Rosie is certified in wilderness air scent. She also has a new Brittany puppy, Daisy, that seems to be really enjoying HRD work so far. Working with her dogs, learning new things, solving problems and helping people are the reasons she was drawn to search and rescue and in the short time she has been involved it has been a very rewarding experience. Ellen is from Wilson, N.C. She graduated from N.C. State University with a degree in Biochemistry and works in the pharmaceutical industry. She has been an animal lover from the day she was born and spent the majority of her childhood riding horses and caring for her various dogs and cats. Her favorite place in the world is a horse barn. During high school, she worked at a veterinary clinic and helped train assistance dogs for hearing impaired people. Ellen also enjoys being a mom, reading, cooking, spending time outdoors and going on adventures with her son. Robert was born November 12, 1964 on Tyndall Air Force Base, Panama City Florida. After some moving around he landed back in Danville, Va. where his father was from. Robert grew up playing football. Once he turned 18 he joined the US Army, where he served almost 15 years. During military service he saw combat action in Desert Storm in 1991. Upon leaving the military he used his computer training to open a point of sells company which he ran until 2013. In 2013 he sold his company due to major back problems. Robert brings to the team a drone air operation. Robert has been a private pilot since 1982 and has hundreds of hours flying. He began flying RC airplanes about 15 years ago and drones about 5 years ago. Scott is employed by Greenville Fire and Rescue. He loves the out of doors and is currently serving on the training committee for CCST. DJ Greene was born & raised in Johnston County. He is a graduate of Princeton High School in Princeton, NC. He is an avid outdoorsman who enjoys hunting, fishing & anything else that requires being outside. DJ has always been ready & willing to help anyone in need. When his wife, Shannon, decided to take classes to become a SARTECH II, he signed up too. 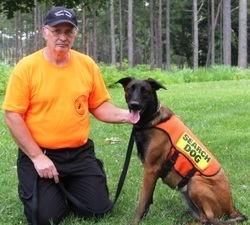 His years of spending time in the woods & on the river proved beneficial in SAR too. They completed the training, got certified & joined the team together in May of 2018. DJ is very supportive & assists his wife in the training of K9 Bodie. Shannon was born & raised in Onslow County, NC and a 1991 graduate of Richlands High. Her need to help serve her community started young. Her junior & senior year of high school, she volunteered as a firefighter with Back Swamp Volunteer Fire Dept. Upon graduation, Shannon moved to Johnston County where she obtained her CNA & worked for Dorothea Dix Hospital in Raleigh. She also went to Johnston Community College where she obtained her EMT-Basic. She served with Clayton Area Rescue for several years. She became involved with search & rescue in 2017, while volunteering in searches for a local missing person. At this point, she decided this was something she very much wanted to pursue. She joined the team & obtained her SARTECH II in May of 2018. She received a bloodhound puppy from Tennessee & began training him right away. At the age of 6 months old, K9 Bodie was certified through Old Dominion in Virginia. Shannon is an avid outdoorsman & enjoys fishing, hunting & camping. She has a daughter, Cheyenne, that Is her heart and her husband, DJ, is her best friend.